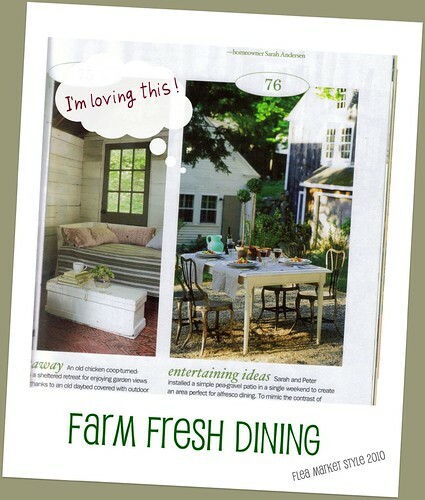 Farm Fresh Dining, originally uploaded by artsy Amy. My previous post, depicting a slightly open door, was all the universe needed. I hope distance/perspective allows me to fully understand why life is tumultuous every now and again. These days I'm foraging for images to represent an aesthetic style swirling around my head. Part Pottery Barn, Martha Stewartesque, somewhat country chic, with a dash of vintage. A timeless but fresh take on traditional farm style. Hence, the photo above. This outdoor dining space is fabulous! Mixy matchy pieces atop a pea gravel carpet is just the look I want outside my kitchen window. Eventually I'll have enough images to visually tour my mental ideal home. If life continues to pitch me around, the word ideal may be removed from the prior sentence. As in "tour my mental home."